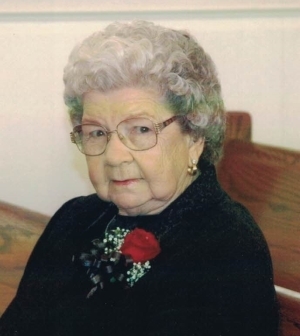 Funeral service for Eunice Washburn Hill, age 91, of Decatur, will be Friday, February 8, 2019, 2:00 p.m. at Shelton Funeral Home Chapel with Rev. Joe David Bailey, Justin Tanner, and Mike Washburn officiating. The family will receive friends from 12:30 p.m. until 2:00 p.m. prior to service. Interment will be in Johnson Chapel Cemetery. Mrs. Hill, who died Monday, February 4, 2019, at her residence, was born April 10, 1927, in Decatur, to the late Jim and Sarah Washburn. She was preceded in death by her husband of 68 years, Fletcher Hill, two brothers, Paul and Johnnie Washburn, and three sisters, Mattie Weldon, Katie Ratliff, and Mary Lou Roberts. Eunice was a member of Summit Baptist Church, and was active on the farm with her husband. She is survived by two daughters, Linda Millsap of Decatur, and Karen Tanner (Jim) of Danville; six grandchildren, Michael Millsap (Genna), Renae Nowak (Stacy), Justin Tanner (Karla), Leslie Cowen (Jonathan), Jared Tanner (Kimberly), and John Tanner (Allison); and nine great-grandchildren, Jada Nowak, Steven Millsap, Makena Millsap, Emmalia Millsap, Tyler Tanner, Lilly Tanner, Ty Tanner, Ali Tanner, and Lane Tanner. Pallbearers will be Michael Millsap, Steven Millsap, Stacy Nowak, Justin Tanner, Jared Tanner, John Tanner, and Jonathan Cowen.